ELVA PPC-10G 10Gbps wireless MMW link had been tested by TWS Technologies in Twello, Netherlands on distance of 6.15 km (3.8 miles). These tests had been fulfilled according to RFC2544 and confirmed 9999,6 Mbps throughput, 50 μs latency and zero frame lost for 6.15 km distance. The link is available for reference visits by third parties and press. TWS Technologies, the division of Dutch-based TWS Group provides wireless solutions for Netherlands’ fast-growing WAN infrastructure market. During April, 2017 they had fulfilled a series of extensive tests for ELVA PPC-10G 10Gbps wireless MMW link according to RFC2544 methodology. 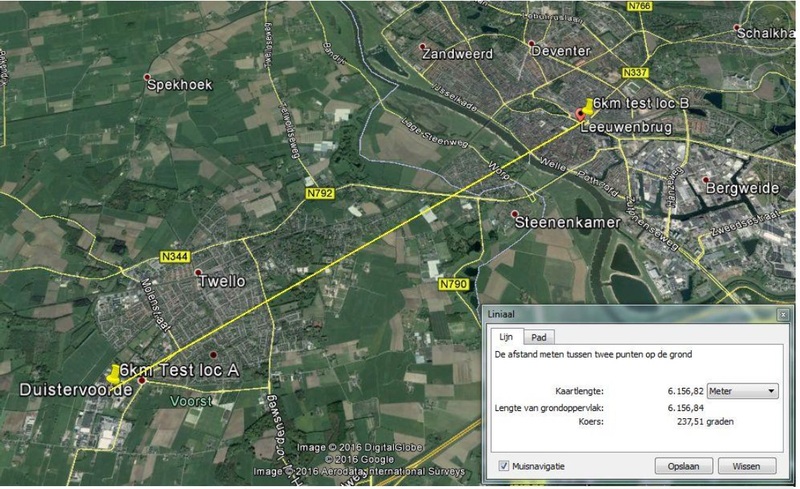 The few distances of 1km/2km/6.15 km were tried, while 6.15 km from Twello to Deventer was the longest one. All test results below are correlated to 6.15 km distance. RFC2544 standard is intended to assess different parameters usually included in service-level agreements (SLA) from network service provider to corporate customers. By completed RFC2544 testis, the service provider can confirm that working parameters of offered Ethernet connection complies to SLA expectations. • PPC-10G throughput tests determined the maximum rate of 9999,6 Mbps for 64 bytes frames to 9294.7 Mbps for 9600 bytes frames, both at L1 level. This measurement translates the obtained rate into the available bandwidth of the service. • Latency tests brought 50 μs (microseconds) for 64 bytes frames to 84 μs for 9600 bytes frames. This parameter measures a time interval which begins from last bit of the input frame reached the input port and to the first bit of the output frame is seen on the output port. In other words, latency is the time it takes a bit to go through the network device. Latency parameter is critical for VoIP services, and latency values over 5 ms (milliseconds) cause degradation in voice quality. • Frame loss tests returned excellent zero % loss. According to RFC2544, Frame loss calculates the percentage of frames that should have been forwarded by a network device under steady state (constant) loads that were not forwarded due to lack of resources. To registering the abovementioned test results, MTS-5800V2 dual 10G network tester had been used. The PPC-10G broadband link provides full-duplex data rates of up to 10 Gbps in a single, zero-footprint, all-outdoor solution. Among ISP applications, the link is intended for Security/Safe City applications, 4G+/LTE Backhaul, Corporate Campus Networks, IPTV. 10 Gigabit millimeter wave (MMW) technology is the best choice for wireless connectivity on distances over 1 mile where free-space optics becomes unstable. For over ten years, TWS technologies has been the Netherlands market leader in the field of high-quality microwave transmission connections and Wi-Fi solutions. We specialize in the realization of innovative wireless connections and in offering custom advice, design and maintenance. Founded in 1993, ELVA-1 is well known player at industrial and scientific instrumentation markets as supplier of components and systems for frequencies from 30 GHz to 1THz. Since 2000, ELVA-1 designs and manufactures ultra high speed radio links according to ECC and FCC requirements. The link operating frequencies include 40.5-43.5GHz, 71-76 & 81-86 GHz, and 92-95 GHz with emphasis on 71-76 & 81-86 GHz. ELVA-1 has contracted manufacturing in St.Petersburg, Russia.